With a simple anatomy lesson, isometric exercises, and attention to alignment in standing poses, you can undo chronic pain in your knees. If you have chronic pain in your knees, if they “snap, crackle, and pop” when you bend or extend them, or if they tend to hyperextend, you may have improper tracking or “dislocation” of the kneecap. This misalignment causes the most common kind of chronic knee pain and damage to the knee joint, which develop slowly over time. Yoga knee therapy might be able to help. Here’s a simple anatomy lesson: The kneecap is designed to slide along a groove in the femur, and it has to move smoothly within that groove to do its job well. If it goes “off track” (and it often does), it grinds away at the cartilage underneath and destabilizes the knee. The ensuing wear and tear is a key reason for knee replacement surgery, which a lot of people believe is necessary because they think the cartilage is “gone.” But the truth is that cartilage can grow back, albeit slowly. 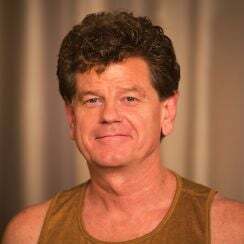 The main problem is that if we don’t correct the imbalanced pull of muscles on the kneecap, we will continue to grind our cartilage down faster than our body can replenish it. If you want to keep the knee healthy you need to strengthen the vastus medialis (the inner quadriceps). In fact, physical therapists consider exercises that strengthen this neglected muscle key in the rehabilitation of knee injuries. So why does the kneecap go off track? The cause lies mainly in the quadriceps, a group of four muscles that merge just above the knee into a single quadriceps tendon. This tendon surrounds and attaches to the kneecap, continuing down below the kneecap as the patellar ligament, where it attaches to the tibia (shin bone). The kneecap serves an important mechanical function. The quadriceps tendon passes over the kneecap like a rope over a pulley, and the kneecap—like a pulley—increases the strength of the quadriceps to straighten the leg by 30 percent. Together, the quadriceps and the kneecap form the “extensor mechanism” for straightening the leg. Misalignments come when the “rope” of the quadriceps exerts a sideways pull on the kneecap “pulley,” creating friction in the mechanism. Hatha yoga has a lot to offer to correct this misalignment; the standing poses are especially effective. But be forewarned: Misalignments of the knee in various asanas can amplify the imbalances that lead to injury and can aggravate existing problems instead of correcting them. The good news is that good alignment and proper tracking are easy to achieve—once you know what to pay attention to. Why Are We Prone to Knee Problems? Our bodies are predisposed to injuries of the extensor mechanism because the hip joints are wider than the knees in a neutral standing position. The natural Y-shaped configuration to the leg bones promotes uneven contraction of the quadriceps, and problems such as hyperextension of the knees make these natural imbalances even worse. As a result, when we contract the quadriceps to straighten the leg, the unevenness of the contraction tends to pull the kneecap to the outside, thanks to the greater pull of the outermost quadriceps (the vastus lateralis). The innermost quadriceps (the vastus medialis) is most responsible for counteracting this pull. This muscle tends to be weak and underused, while the outer thigh muscle tends to be stronger from overuse. So if you want to keep the knee healthy (i.e., tracking properly in its femoral groove), you need to learn to strengthen the vastus medialis. In fact, physical therapists consider exercises to strengthen this neglected muscle key in the rehabilitation of knee injuries. Structural misalignments tend to limit the vastus medialis' proper functioning--and can even weaken it in relation to the other quadriceps muscles, making it even harder to work with. Yoga students are often told to “lift the kneecaps” in straight-legged poses to engage their quadriceps and, ostensibly, protect their knees from hyperextension. But lifting the kneecaps in a healthy and balanced way requires focused attention, especially if you already have problems in your knees. This is easy enough to check. Sit or stand with your legs straight and your feet parallel to each other, then engage your thigh muscles so that your kneecaps “lift” or pull toward your hips. Do your kneecaps move up in a straight line, or do they move in an angle toward the outside of your knees? If the latter is the case, then you need to strengthen the vastus medialis, the inner quad, and learn how to use it properly. This has its challenges. First, it can be difficult to find and isolate this muscle, because you can feel the vastus medialis firming most only in the last 10 to 20 degrees of knee extension. So it takes focused attention to even feel and understand what the muscle does. Second, structural misalignments that cannot be changed (like being knock-kneed or bowlegged) tend to limit the vastus medialis’s proper functioning—and can even weaken it in relation to the other quadriceps muscles, making it even harder to work with. Finally, although engaging the vastus medialis properly can prevent hyperextension of the knee, doing so is essentially useless if the knee is already hyperextended. Consequently, it’s important to consciously avoid hyperextension in the first place, rather than relying on the strengthening exercises to prevent it. This is critical, because the habit of hyperextension will otherwise pull you right back into your imbalanced patterns of knee extension even after you do the work of strengthening the vastus medialis. 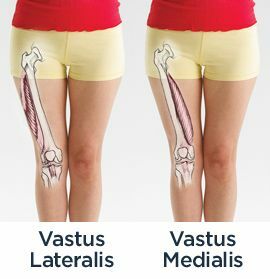 Find your vastus medialis, the inner quadriceps muscle. Strengthen it with small extension exercises. Continue to strengthen the vastus medialis in bent-knee warrior poses. Incorporate that work into straight-legged asanas. Isometric extensions will help you identify the inner quad and its action as you strengthen it. To do this, sit in dandasana (staff pose) with your legs extended forward. Support your upper back against a wall if that’s more comfortable. Roll up a small blanket or sticky mat and place it under your knees to prevent hyperextension while your quadriceps are contracted. Next, rotate your right leg out 10 to 15 degrees (if the sole of your foot were on a clock face, your toes would be pointing to one o’clock).To find the vastus medialis, place your fingers about one inch above the inner (or medial) corner of your kneecap, and then walk your fingers about one and a half inches toward the inner thigh. Straighten your leg slowly to feel the quadriceps engage. You’re looking in particular for the firming of the teardrop-shaped muscle just under your fingers. This is the vastus medialis, the inner quadriceps. You will feel it fully engage as your leg straightens completely. Hold the contraction for 8 to 10 seconds, then release. Repeat this for two more rounds, making sure you don’t extend the leg so hard that you feel locking or pinching in the knee. Repeat this exercise with the left leg. Next, do the same exercise without rotating the leg out. Keep your leg aligned so that your kneecap faces straight up toward the ceiling. Extend your leg fully and see if you can engage the inner part of the quadriceps—where you’re touching with your fingers—as strongly as you can engage the outer part of the quadriceps. Watch how your kneecap moves in a straight line along the center of the knee joint when your quads are engaged in a balanced way, rather than pulling to the outside. Repeat on the other leg. You can do these exercises several times a day—just be careful not to fatigue the muscle by doing too many sets at a time. Among the traditional asanas, the warrior poses (virabhadrasana I and II), in which the front leg is bent and the back leg is straight, are particularly effective for strengthening the vastus medialis, if done with proper alignment and action. Because although it’s easiest to isolate this muscle’s action when the leg is fully extended, it is also engaged and strengthened when the knee is bent at a 90 degree angle and the leg is bearing weight—as long as the knee is positioned vertically over the heel and the inner heel remains grounded. This is the case in a well-aligned warrior pose. To come into the pose, step your feet wide apart, while extending your arms out to either side. Your feet should be roughly beneath your wrists. Turn your left foot in about 30 degrees and your right leg out 90 degrees. Keep your torso upright as you bend your right knee. Make sure your knee does not go beyond your ankle and toes: Keep the shin vertical while striving to bring the thigh parallel to the floor, so the leg is bent at a right angle. If the knee goes beyond your ankle and your weight shifts into your toes, widen the distance between your feet. Turn your head to look out over your right fingertips. Even when your stance is the proper width and your knee bends to a right angle, a common—and harmful—misalignment is to let the thigh turn inward so that the knee points more toward the big toe. This happens especially when the arch of the foot collapses, which places stress on the inner knee and prevents you from strengthening the quadriceps in a balanced way. A less common misalignment is to shift the weight to the outer edge of the foot, so that the knee turns more toward the little toe. In this case the muscles along the outer thigh tighten, and the outer (lateral) side of the knee is stressed. In this case, too, the vastus medialis doesn’t function properly. TO PROTECT THE KNEE make sure it’s above the second toe and that both the toe and the knee are on the same plane as the sit bone. If the vastus medialis is not properly engaged the knee falls inward. The vastus laterialis then pulls the kneecap outward, stressing the inner knee. When the weight shifts to the lower heel, the knee splays out over the little toes and stresses the inner knee. Proper alignment in the warrior pose allows the vastus medialis to work in harmony with the other quadriceps to align and strengthen the extensor mechanism of the knee. Misalignments, on the other hand, disable the vastus medialis and increase the muscular imbalances that cause wear in the knee. You can protect your knees and strengthen the vastus medialis by following three basic rules for the warrior poses. First, make sure your knee is bent properly to a right angle, so the weight is centered in your heel. If your toes are gripping, it’s a sign that your knee is going too far beyond your heel. Second, don’t let the inner arch of your foot collapse, for this is a sign that your knee is turning inward too much. We sometimes compensate for this collapse by shifting weight to the outer edge of the foot, causing the inner heel to lift. But this stresses the outer knee and defeats the purpose of the pose. The challenge of aligning the knee is to keep your inner heel and big toe mound grounded while keeping the inner arch of the foot lifted. These two actions—grounding and lifting—will keep the knee from turning inward or outward too much. Lift your toes to help engage and lift the inner arch; as you bend your knee, draw the energy from the inner arch up through the calf to your inner knee, so that your knee remains directly over your heel and does not turn inward. Third, make sure that the heel, kneecap, and hip joint of your bent leg are in the same plane by allowing a slight turn of the hips. (If you were doing the pose next to a wall, your outer right ankle, knee, and hip would all be touching it.) To achieve this, when you bend your knee, let your outer hip descend toward the floor (as if you had something heavy in your hip pocket) as you lift energy from your inner arch up through your inner knee. This will make your leg spiral out as you bend it, until your heel, kneecap, and hip joint are all aligned. 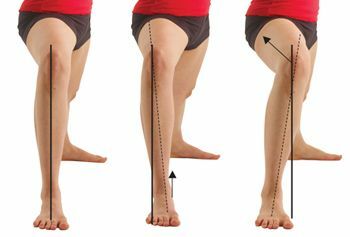 The purpose of these three actions in the bent leg is to ensure that all four quadriceps muscles are working harmoniously to stabilize the knee. As a result, the vastus medialis gets a much-needed workout that brings it into balance with the other quadriceps. To confirm this, gently pinch your thigh above the inner knee to check that the muscle there—the vastus medialis—is as firm as the thigh muscles at the outer knee. Standing poses can strengthen and stabilize your knees, helping you to overcome structural imbalances that might otherwise lead to chronic wear and tear (and ensuing pain) in your knees. Proper alignment of the knee in the warrior poses automatically gives the vastus medialis a healthy workout. Now you can apply these same actions to the straight-legged poses like trikonasana, in which working the vastus medialis consciously is more challenging. Step your feet wide apart, turning your left foot in 45 degrees and your right leg out 90 degrees, toward the edge of your mat. Bend your right knee slightly and align your heel, knee, and hip as in warrior pose. Then straighten the leg mindfully, engaging the vastus medialis, especially in the last 20 degrees of extension. If you engage this muscle properly and your leg is aligned as you straighten it, you’ll see your kneecap draw straight up your leg, and you’ll find it nearly impossible to lock your knee. But if you let go of the vastus medialis even for an instant, the knee can easily hyperextend and lock into that position. Fold at the hip crease to take trikonasana to the right. Keep the vastus medialis firm and lift along your inner thigh, maintaining the straightness of your leg without locking the knee. If you feel pressure in the knee joint, you’ve probably relaxed the vastus medialis and hyperextended your knee. Come out of the pose and try again. As a bonus for good alignment, you’ll feel a stronger stretch along the inner edge of your thigh, from your inner knee back toward your sit bone. Be careful not to overstretch: use the support of a block for your hand if you need it. The standing poses of hatha yoga provide powerful and effective means for strengthening and stabilizing your knees, helping you to overcome structural imbalances that might otherwise lead to chronic wear and tear (and ensuing pain) in your knees. A little extra mindfulness in aligning and working your legs in these poses will enhance the natural therapeutic benefits these poses have to offer.